Storytelling is a powerful tool to inspire and engage people, communities and organisations to contribute ideas, energy and resources to advance a cause. However, to achieve these results, storytelling must be strategic. It is often assumed that the majority of our time at Digital Storytellers is spent behind the camera. In fact, perhaps the most important work (and the most time consuming) is the task of simply discovering the best, and most impactful, story to tell. 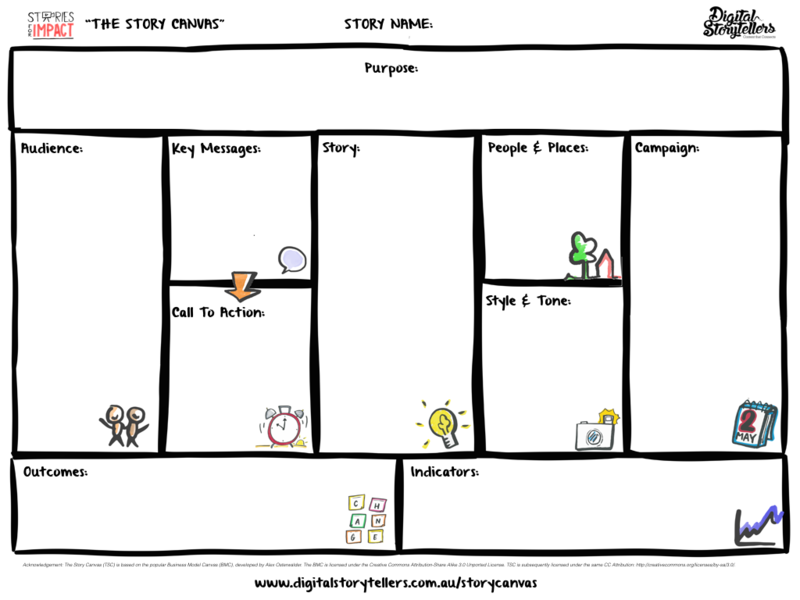 After working with hundreds of nonprofits, social enterprises and impact organisations, we’ve distilled our steps for developing awesome stories into an easy to follow process, The Story Canvas. The Story Canvas is based on the Business Model Canvas’ and is a simple to use tool to develop and iterate your story ideas. If you think of your story as an incredible cake that you’re about to bake, the Story Canvas is list of ingredients, helping you pull all the right elements together to whip up something amazing! Follow our step-by-step guide and have your beautiful Story Canvas delivered directly to your inbox. Remember, there are no right or wrong answers when completing the Story Canvas, it is just a brainstorming tool and you can always start again! Why am I (or my team) passionate about this? What future world are we trying to create? Why should the audience care? Why would they not care? Before you get too deep in thinking about ‘what’ you want to say in your story, you should take a step back and think about ‘why’ you are telling the story in the first place. What is the future that you are trying to create through your work? Many changemakers and impact organisations tell their stories from the outside in, getting caught up in the small details about what they are doing. But the most powerful leaders, organisations and movements gain traction by communicating a strong vision for the future, deeply embedded in their values, and rallying a community that shares that vision. Why? This is the core belief of the cause, organisation or project. Why does this initiative exist? How? This is how the cause organisation or project fulfills that core belief. What high level, but tangible, changes do you want to happen as a result of your storytelling? Increased awareness or understanding? Shifts in perception or attitude? Community building? Capacity building? Policy change? How will we measure success with some specific metrics & outcomes? Increased website traffic? Newsletter signups? Dollars raised? Engagement with a particular stakeholder? Views, shares or engagement on social media? Program registrations? Survey responses? What impact will your story create in the world? Don't let impact become an afterthought. It should inform how your story is crafted, from who you tell to how you say it and what you ask them to do. Outcomes - What high level, but tangible, changes do you want to happen as a result of your storytelling? E.g. Increased awareness or understanding? Shifts in perception or attitude? Community building? Capacity building? Policy change? Indicators - What are the specific and measurable targets you will use to track your goals? E.g. Increased website traffic? Newsletter signups? Dollars raised? Views, shares or engagement on social media? Program registrations? Who are your Primary and Secondary Audiences? It is unlikely that a single story will inspire and engage a broad audience. Therefore, the more targeted your story is towards a particular audience, the more likely it is that your story will resonate with that audience and get them to take action. It can be helpful to break your audience down into Primary and Secondary audiences. This allows you to consider multiple audiences but also prompts you to prioritize one group over the other when making decisions about your story. Try building imaginary personas who represent people in your primary and secondary target audience, to help imagine how they might respond to your story. By using personas, you can be more strategic in engaging your audience and relating to them on a human level. Give them a name, outline their interests, their values, their education level,etc., and then think about how that person will react to your story. If you’re not sure, ASK somebody who represents this demographic! Who will feature in your story? Who are the people connected to our project or organisation whose stories are compelling? Who do you find yourself talking about because their story is particularly unique or interesting? Who will my audience relate to? What locations will be used in your story? Think of the places in your story as more characters who will help you communicate different elements of your story. Is it bustling or isolated? What time of day is it? Is it rural or urban? Should you feature natural or man-made structures? People and places can be used to visually communicate parts of your story that words cannot. So be intentional and strategic with the characters and locations featured in your story and do not always go with the most obvious choice. It is through the characters in your story that your audience will develop empathy and become emotionally invested. Your characters will help convey the story through their appearance, their age, ethnicity or even the clothing they are wearing. Audiences will empathise most with a story of someone they can relate to and a story that they can imagine themselves within. Think about featuring characters in the same demographic as your audience, whether this be be their age, ethnicity, ideology etc. What 3 things do you want your audience to remember? To support your cause, what do your audiences need to know? What are the most important ideas your audiences need to understand the problem and the solution? Why is this issue urgent? Why must your audience act right now? In a world of information overload, your audience is never going to remember everything that you have to say. So, it is incredibly important to make sure that what they do remember are the most compelling messages or arguments supporting your project, cause or organisation. Honing in on three clear key messages will be helpful later down the track when you must make decisions on what to include and exclude from your story. If something in your story is not contributing to one of your key messages, it will merely be detracting from it. It’s not enough for your audience to just be inspired, angered, entertained or shocked by a story. When considering stories for 'impact' it's important to consider the next step that your audience might take. Your call to action does not have to be hard and tangible, like pledging to a campaign. It may be a soft call, like having a conversation or reconsidering an idea, but it does need to tie back to the Outcomes and Indicators you'd like to see as a result of your story. What does our story look and feel like? List some key imagery and reference samples. What is the musical vibe? How will your story look & feel? Think about the emotional reaction you hope to get from your audience. Do you want them to be angry? Hopeful? Sad? Excited? Once you have decided on this you can be intentional about how different elements of story can help you convey that. Colours - Warm golden tones? Cold sterile blues? Passionate red? Music - Uplifting? Inspirational? Sombre? Quirky? Pace of story - Dynamic fast cuts? Or slower gradual transitions? Font - Friendly? Professional? Fun? Time of day - Optimistic sunrise? Romantic sunset? Get Inspired! Collect examples of what you want your piece to look or sound like and, just as importantly, what you DON’T want your piece to be. Create collages, mood boards and playlists to reference. How will you get your story out there? Map the key touchpoints on a timeline. A great story cannot inspire people to action unless it’s seen or heard. Your story campaign should be planned BEFORE you create your story, not after. Your campaign plan may help you make decisions about other elements of your storytelling including the format of your story (e.g. is it going to be a film, photography, podcast or something else? ), the length of your story (e.g. an eight minute video is fine for a presentation but for social media it just won’t cut it), the people and places featured in your story and the call to action. Go back to your audience personas and think about how they will first encounter your story. Is it a particular online or offline publication? Are they already subscribed to your newsletter? Do they follow a certain hashtag on Twitter? Consider the time-specific communication opportunities that are available. Is there a relevant event happening where your story could be screened or distributed? Is there an upcoming Twitter Chat that touches on your issue and story? Is there a world or national day that you could leverage to spread your story? You should try to gain the support of leaders, prominent members of the community or even celebrities who can champion your story and help it reach a broader audience. Again, think back to your target audience and the voices that likely influence them. Is there an influencer that might have good reason to support your cause? Finally, consider the ways in which your audience can continue the journey with your cause, organization or project after they have heard your story and make sure that you have a way to facilitate this. For example, if your call to action is to ‘donate’ is the donate button prominently displayed on your website? If your call to action is to connect on social media, do you have compelling and relevant content to share? How does it start (hook), how does it end (jab), and what memorable moments happen in between (plot)? What type of story is it? An explainer? Vision Story? Impact Story? Or a personal story using the Hero’s journey? You’ve almost completed your Story Canvas! Well… almost. As you’ve probably noticed, there is still one big section to cover - Story.What you’ve gathered together on your Story Canvas is a whole bunch of information. Story is the way that these ingredients are arranged together so that they have meaning for our audience. Humans are hard-wired to connect through story - from the oral stories used by ancient cultures to share information about traditions, ceremonies and survival to the anecdotes shared by our friends on social media. It is through story that we make sense of the world around us, connect with each other and share our ideas. While there is no universal prescription for narrative, good stories often have the following structure. Something to shock, surprise, delight or intrigue the audience into wanting to know more. A seemingly insurmountable obstacle or question left unanswered. This challenge creates a question in the viewer’s mind and keep them engaged because they want to find out how this challenge is overcome. The process through which the challenge is overcome or the question is answered. It is on the journey that there is opportunity for growth or change for the characters in the story and also for the audience. There may be an epiphany or ‘aha!’ moment along the way where lessons are learnt and wisdom gained. The conflict is resolved or the question is answered. Often the resolution results in new learnings and takeaways for the characters and audience. The Hero’s Journey is a useful narrative to consider for positive change stories. This framework can help our audience understand your project or organisation’s work in human terms, and see its relevance to their lives. But here’s the secret - it’s not your project or organisation that is the hero of the journey. The most empowering story that you can tell is the one where the AUDIENCE is the hero. How can you position them at the centre of the story? How will their actions become the key to overcoming obstacles and creating a better world? Only when people can locate themselves inside the story will they truly belong and participate in your narrative for change. A motivational rallying call to a movement or community, bringing together many voices including those at the grassroots, thought leaders, decision makers and pioneers. A piece that conveys your work, idea, or organisation simply, easily and briefly, often using hand-crafted animation and or illustration to communicate concepts in a visually-engaging way. Which services / mediums do you require to tell your story? How did you hear about the Story Canvas? Are you interested in future trainings? We'll teach you how to find, make, edit and share your impact story using smartphones and affordable technology! We'll send you tips on impact storytelling, bringing your story to life using smartphones and affordable technology and inspirational purpose-driven stories from around the world!